任红艳, 吴伟, 李乔玄, 鲁亮. 基于反向传播神经网络模型的广东省登革热疫情预测研究[J]. 中国媒介生物学及控制杂志, 2018, 29(3): 221-225. REN Hong-yan, WU Wei, LI Qiao-xuan, LU Liang. Prediction of dengue fever based on back propagation neural network model in Guangdong, China[J]. Chin J Vector Biol & Control, 2018, 29(3): 221-225. Abstract: Objective The prediction model of dengue fever based on back propagation (BP) neural network was constructed and verified, which provided a reference for the prevention and control of dengue. Methods Based on the temporal and spatial data of dengue fever epidemics and geographical environment, the spatio-temporal distribution characteristics of dengue fever and the spatial autocorrelation of dengue fever cases were analyzed. Pearson's method was used to analyze the correlation between dengue fever and various influencing factors in Guangzhou and Foshan areas. Then, Matlab 7.0 software was used to complete BP neural network prediction model construction, training and simulation. 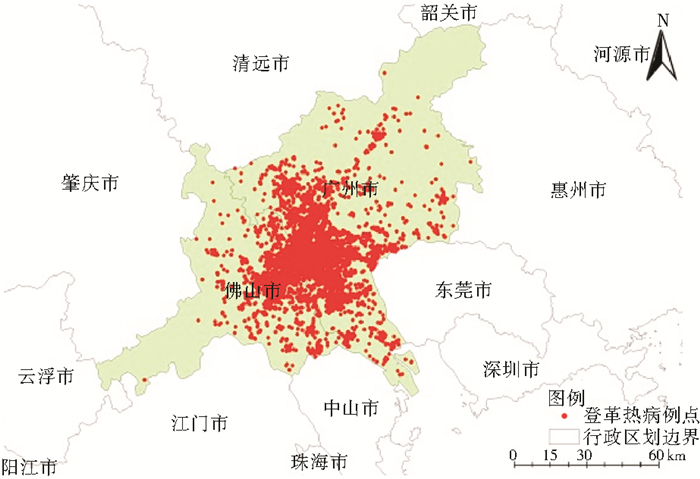 Results From August to October 2014, the highest incidence of dengue cases in Guangzhou and Foshan area was 90, 386, 456 cases/km2, respectively, and the spatial distribution of the epidemics mainly concentrated in Guangzhou (P=0.001, Z=134.402 5). The global Moran's I index was 0.606 5. In the same month of dengue fever, the local epidemic situation of dengue in Guangzhou and Foshan district was significantly different. The outbreaks of the local cases were correlated to the epidemics of the previous month (July, August and September) (local cases and imported cases), meteorological (temperature, humidity and precipitation), and social (population density, urban and rural residential land, forest, farmland)factors. The correlation coefficient between the predicted value and the true value was 0.773 and the root mean square error was 7.522 0. Conclusion Dengue epidemics in Guangzhou and Foshan areas was not randomly distributed but obviously spatially clustered. The occurrence of dengue fever is influenced by many factors and the BP neural network model can effectively predict the temporal and spatial distribution of dengue fever in Guangzhou and Foshan areas. 毛祥华, 张再兴. 中国登革热的流行现状[J]. 中国病原生物学杂志, 2007, 2(5): 385-388. 孟凤霞, 王义冠, 冯磊, 等. 我国登革热疫情防控与媒介伊蚊的综合治理[J]. 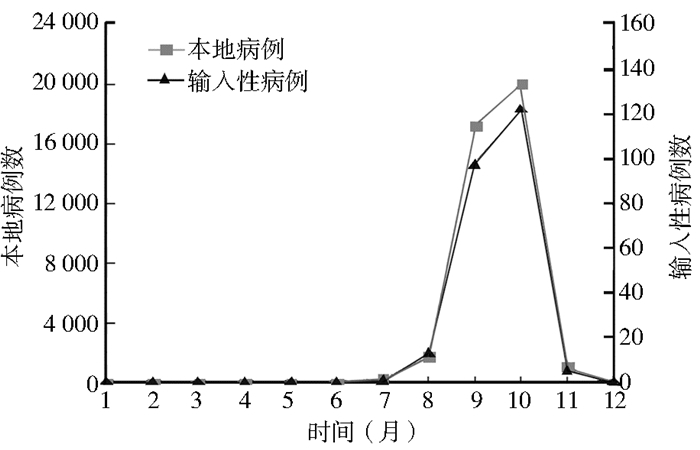 中国媒介生物学及控制杂志, 2015, 26(1): 4-10. 邹钦. 广东省2014年登革热疫情防控实践与思考[J]. 中华卫生杀虫药械, 2015, 21(6): 630-632. 李国栋, 张俊华, 焦耿军, 等. 气候变化对传染病暴发流行的影响研究进展[J]. 生态学报, 2013, 33(21): 6762-6773. Arav-Boger R, Boger YS, Foster CB, et al. The use of artificial neural networks in prediction of congenital CMV outcome from sequence data[J]. Bioinform Biol Insights, 2008, 2: 281-289. 谢旭, 任金马, 牟瑾, 等. 深圳市肠道传染病与气象及媒介因素的贝叶斯正规化BP神经网络模型[J]. 医学动物防制, 2007, 23(7): 485-488. 樊景春, 林华亮, 吴海霞, 等. 广东省2006-2011年登革热时空分布特征[J]. 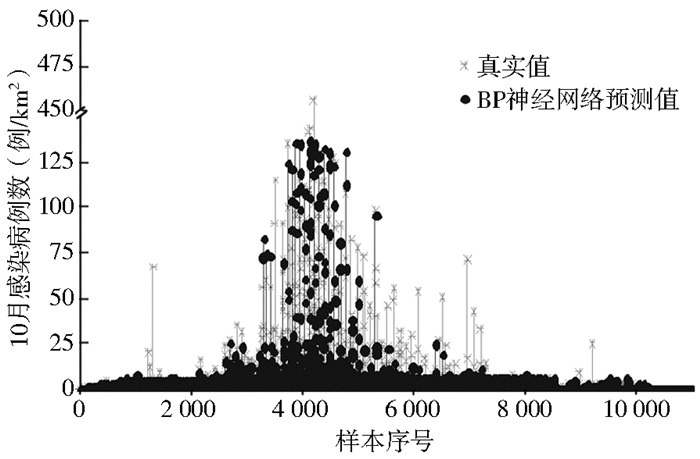 中国媒介生物学及控制杂志, 2013, 24(5): 389-391. 曲波, 黄德生, 郭海强, 等. 干旱地区伤寒副伤寒与气象因素关系的BP神经网络模型[J]. 中国卫生统计, 2004, 21(3): 165-167. 曲波, 黄德生, 郭海强, 等. 流行性脑脊髓膜炎与气象因素关系的BP神经网络模型研究[J]. 中国医科大学学报, 2006, 35(2): 158-159, 165.